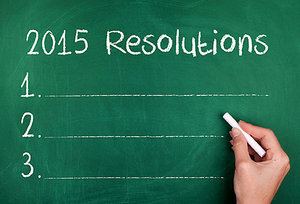 Yes, it's about that time of year again: time to review your 2015 accomplishments – more specifically, the resolutions you made at the start of the year – and make your 2016 list. How's the year gone for you? Did you take your healthy resolutions to heart ... or are you doomed to repeat them (unsuccessfully) in 2016? Here's a simple game plan for success in the new year: health and wellness resolutions that are manageable, achievable and make you feel great! The 30-Minute Rule: No matter the day, no matter the deadlines, find at least 30 minutes (at once or in 10-minute blocks) to be physically active. Whether it's taking an after-dinner stroll, biking to work, walking the dog or playing tag with the kids, find ways to inject motion into your daily life. Keep the Couch Clean: Limit your television time (and especially your kids' time) as much as possible. In general, there's a direct correlation between time spent on the couch and two unhealthy habits: moving less and snacking more. Ditch Dessert: Change your mindset when it comes to eating dessert every night. You can do it by only treating yourself to dessert a few nights a week or by expanding your definition of dessert to include fruit, yogurt or even a non-sugary snack (crackers and cheese, carrots with spinach dip, etc.). It's a Water World: And we don't just mean in the sense of drinking more, which has numerous health and weight-loss benefits. We also mean swimming more (exercise), taking more relaxing baths (stress relief) and when weather permits, enjoying more outdoors time with friends and family. Time Outs Aren't Just for Kids: Stress can be a killer, both literally and figuratively. From a resolution perspective, it can waylay even your best efforts, putting you in an irritated, agitated mood in which you'd rather sit on the couch and eat a gallon of ice cream than stick to "the plan." When you're feeling stressed, take a time out; a few deep breaths, a quick walk and a little time to process your thoughts can go a long way. 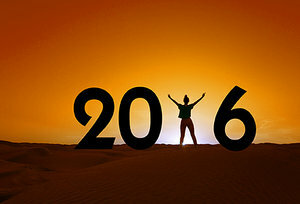 Make 2016 your best year ever by taking these and other healthy-living tips to heart. Don't think you can do it alone? 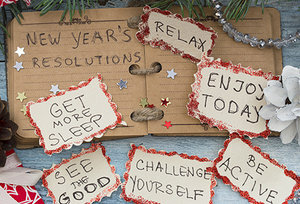 Then make your resolutions with your partner or a friend and encourage one another to shared success. You'll both be grateful you did. Is the year of Goat or sheep? On Thursday, February 19, 2015 is the Chinese New Year, the longest and most important holiday in the Chinese calendar. 2015 is the year of the Goat, but you may see it referred to as the “Year of the Sheep” too. The confusion stems from the Chinese character “yang”, which can translate in colloquial Chinese as either sheep or goat. Those born in 1919, 1931, 1943, 1967, 1979, 1991 or 2003 are goats, who can count their lucky colours as brown, red and purple. Their characters are supposedly kind and peaceable, while their best months are supposedly August and November and their lucky flowers are primroses and carnations. According to the legends, Chinese New Year started on month 1 during the reign of Xia Dynasty. However, in 221 BC, Qin Shi Huang shifted it from Month 1 to Month 10. Again in 104 BC, Emperor Wu changed it to month 1. According to the myth, Lord Buddha once invited all the animals for Chinese New Year. However, only 12 animals had come and Buddha blessed them by naming New Years by the names of those animals. These animals are Pig, Rat, Ox, Tiger, Rabbit, Dragon, Snake, Horse, Sheep, Monkey, Rooster, and Dog. Chinese New Year is called Lunar New Year in China. According to the tradition, Chinese people age one year together and the on the 7th day of the first month of New Year, Chinese people become one year older. On the lantern festival, all the members of the family come down to the street with a lantern in their hands. The lantern festival marks the official ending of the festival. A fortune cookie, ‘tsujiura senbei' is associated with the Chinese New Year celebrations. In Chinese New Year, the married couples present Ang Pow to each other. It is a red envelop that contains even numbered amount of money but the amount should not have a 4 at the end, because 4 is considered equivalent to death. China Central Television broadcast a special presentation of Lunar New Year's Eve. Bamboo stems were filled with gunpowder and were burnt. The sounds are believed to wipe away all the evil spirits. The Chinese New Year is based on the lunar cycles. An entire cycle of the Chinese calendar is completed after every 60 years. Chinese calendar is the oldest calendars in the world. According to the Chinese New Year traditions, red is the lucky color for Chinese New Year and it is widely used in decorations.